Just got back from a week in Wyoming at Mike Brotherton’s Launch Pad workshop, an intensive NASA-sponsored workshop for pro SF writers. It was a fantastic week, and not just because it allowed me to escape the tropical humidity that D.C. has been plunged into for what seems like eons. 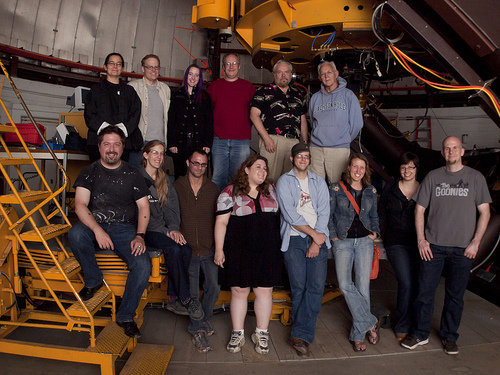 Awesome lectures, brilliant stargazing, and unforgettable people….and thanks to fellow scribe Jeremiah Tolbert you see the attached picture of all of us. Cecilia Tan, Monte Cook, Alice Henderson, Ian Randal Strock, Walter Jon Williams, Bud Sparhawk, Instructor Mike Brotherton, Carrie Vaughn, David Williams, Rachel Swirsky, Nicholos Wethington, Kelly Barnhill, Genevieve Valentine, and John Joseph Adams. Not pictured: Marjorie M. Liu and guest instructor Kevin Grazier. Back from ComicCon, which ruled. I’ll have more detailed thoughts later, but in meantime, I forgot to link to an article I wrote for Bantam’s Suvudu last week re my thoughts on the fortieth anniversary of Apollo. So check it out. . .
UPDATE: Discover Magazine has written up an account of proceedings!